In addition to the worship aids, infant care and children’s formation, children are always welcome in our worship services. Our main weekly worship service is the Holy Eucharist (sharing of the bread and wine), also known as: the Lord’s Supper or Holy Communion. If you like church quiet, traditional, and direct from the prayer book, this is the service for you. We use the Rite I liturgy for Eucharist from The Book of Common Prayer. At 10 am you’ll find a variety of music styles mixed into a core of traditional Anglican music, and a vibrant, prayerful community that instantly feels like family. Sunday School is offered concurrently for children pre-K thru 5th grades, with the children joining their parents (and dozens of adopted grandparents) for Communion. Worship aids are available to assist young children, and professional nursery care is available for infants and toddlers. 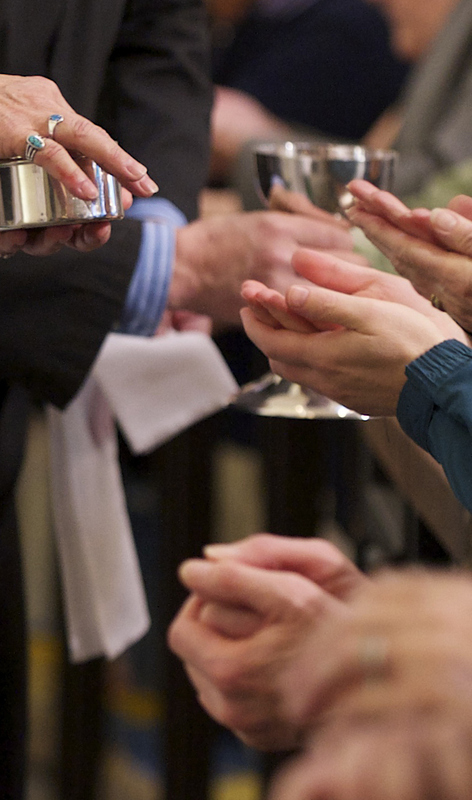 A simple Eucharist with a focus on the lives of the saints. A perfect way to spend your lunch hour if you live or work nearby. Call in a lunch order by 10 am (approx $5), and stay for lunch with the clergy and staff. Call the church Office to place your lunch order: 310-375-4617. A healing environment for the work of God’s grace. Taizé music, scripture and prayer for healing – physical, mental, emotional, psychological or spiritual, plus the option of private prayer with a prayer team member. Read more.